Most people in Viet Nam buy and sell things using cash. However, more and more are using cards that their banks give them and do not need to carry cash around with them. There are reasons it is easier for people to use cash and there are also reasons why it is easier for people to carry cards. HCM CITY (VNS)— Vietnamese consumers have welcomed electronic card ownership and use, according to the results of a survey conducted by Visa. The Payments and Cards Market in Viet Nam study, released last Friday, was carried out by TNS Vietnam for Visa. Respondents, when asked what made them feel they were being smart with their money, credit cards came out on top at 53 per cent, while debit cards and cash scored 38 per cent and 30 per cent, respectively. 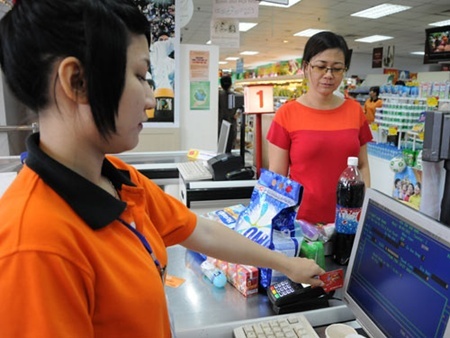 Similarly, credit and debit cards registered as equal in terms of consumers feeling as if they were doing the "right thing" with their finances, according to the results of 1,200 interviews conducted in Ha Noi, Hai Phong, Da Nang and HCM City. Respondents felt as if they were living within their means, regardless of whether they were using credit or debit cards or cash. "These results reflect a very positive outlook for the growth of electronic payments in this rapidly developing market. In an economy that is heavily reliant on cash, these figures are certainly encouraging," said Lorijon Bacchi, Visa country manager for Viet Nam, Cambodia and Laos. The study also uncovered some interesting attitudes towards cash, which is currently the predominant payment method in Viet Nam. Forty-two per cent of respondents felt safe carrying credit cards, but only 20 per cent felt safe carrying cash. Around 19 per cent indicated they felt vulnerable while carrying cash, and only 4 per cent felt vulnerable carrying credit cards. "It's noteworthy that the figures show consumers in Viet Nam acknowledging the inherent disadvantages in relying on cash, with the majority of respondents indicating they felt vulnerable carrying physical money than payment cards. This study also revealed that Vietnamese consumers are becoming much more knowledgeable about card usage and financial management," added Bacchi. "According to another research conducted by Moody's Analytics, electronic payments added US$1.2 billion to the GDP of Viet Nam between 2008 and 2012. Given that the TNS study points to significant potential for growth within electronic payments in the country, it appears that the time is certainly right to start transitioning the economy through the ‘non-cash decree' with a view to reduce the country's reliance on cash," she said. There are still room for growth in card ownership and usage as only 4 per cent of the population (in the four cities) own credit cards, but the rate for debit cards stands at 42 per cent. Vietnamese consumers have welcomed electronic card ownership and use, according to the results of a survey conducted by Visa. Consumers are people who buy and use things. A survey is a study of something that usually involves counting and the asking of questions. A respondent to a survey is someone who replies to the survey. A credit card is a little plastic card that banks give to their customers to be able to buy things and pay the bank for them later. A debit card is a card that you can use to buy something with. It transfers money from your account to the account of the seller. To live within your means, means to not spend more than you earn. In an economy that is heavily reliant on cash, these figures are certainly encouraging," said LorijonBacchi, Visa country manager for Viet Nam, Cambodia and Laos. To be reliant on cash means to be dependent on cash. The study also uncovered some interesting attitudes towards cash, which is currently the predominant payment method in Viet Nam. The predominant payment methods in Viet Nam is the way most payments are made in the country. "It's noteworthy that the figures show consumers in Viet Nam acknowledging the inherent disadvantages in relying on cash, with the majority of respondents indicating they felt vulnerable carrying physical money than payment cards. To acknowledge means to be accepting of something. In this case it is about accepting that some aspects of using cash are not necessarily wonderful. To be vulnerable means to be likely to suffer harm. Physical money is cash – in your hand or your pocket rather than in a bank account.
" Given that the TNS study points to significant potential for growth within electronic payments in the country, it appears that the time is certainly right to start transitioning the economy through the ‘non-cash decree' with a view to reduce the country's reliance on cash," she said. Significant potential growth means a realistic sign of something having the chance to do well. Transitioning means changing from one thing into another. However, lack of knowledge about the benefits of credit cards and the procedure were the main barriers to signing up, according to the study. A benefit is something of value that you may get from doing something, such as using a credit card . A procedure is a way of doing something in a very specific order. 1. The kind of study that Visa carried out. 2. Another country Lorijon Bacchi is in charge of for Visa. 3. Something people lack about cards that seems to stop them from using them. 4. The kind of card that transfers money from your account to the seller's account when you use it to buy something. 5. Something only 20 percent of people interviewed felt safe carrying. 1. Survey; 2. Cambodia; 3. Knowledge; 4. Debit; 5. Cash.